from the silent decks, pleading with the love scorned vocalist to hit the notes and vocalise his recent misfortune with his loved one, mild bass line gels rhythmatically with the second horn coming, inciting the somewhat custom made deep lyrics… “You’ve ruined a perfect love affair, way beyond repair” complement the funeral pace instrumentation that saturate your soul with a moving feel that leaves the likes of Ray Pollard“The Drifter” standing! (Ah a classic example of what most folk call deep soul..)“The Drifter” is a masterpiece but is Big City/Jamaican soul-NOT deep soul, a classification of style that many fail to grasp!. (Perhaps a few lines in a later review of what is and isn’t deep soul)…. Wonderful vocals, doo-wop throw back group harmony replies this has the lot, even the mandatory screams fade out this all the great. I reckon lead is James Bowens who wrote both sides with Bill Smith, James incidentally released a 45 on Rooevelt Lee another Rite press recording from around 1967/8 that basically has carbon copy writing and connection details.I checked the racks at home and found three records in 45 formats by these guys, info seems to be rather sparse to say the least so I’m pretty much working on supposition. All three 45’s were recorded and released within two years period circa 71/73, also the group/artists names differ slightly on each release ie. Double O Demingos “ Storm warning”, Double O and his Demingos “1000 tears too late” and finally Double O’s Demingo’s “Colour one tear black”. I checked the racks at home and found three records in 45 formats by these guys, info seems to be rather sparse to say the least so I’m pretty much working on supposition. All three 45’s were recorded and released within two years period circa 71/73, also the group/artists names differ slightly on each release ie. 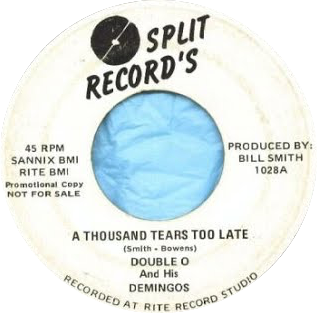 Double O Demingos “ Storm warning”, Double O and his Demingos “1000 tears too late” and finally Double O’s Demingo’s “Colour one tear black”.